China has responded to repeated calls for Beijing to put pressure on North Korea, stating that such responsibility does not rest solely on China. President Trump has repeatedly urged for Beijing to use its influence as Pyongyang's sole economic lifeline. 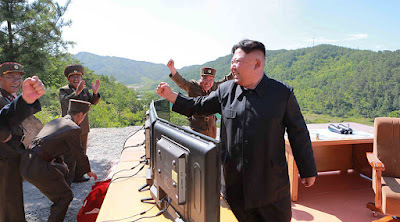 “Recently, certain people, talking about the Korean Peninsula nuclear issue, have been exaggerating and giving prominence to the so-called ‘China responsibility theory’,” Foreign Ministry spokesman Geng Shuang told a daily news briefing on Tuesday, as quoted by Reuters. “I think this either shows lack of a full, correct knowledge of the issue, or there are ulterior motives for it, trying to shift responsibility. “Asking others to do work, but doing nothing themselves is not OK,” he added. Although Geng did not mention any names during his Tuesday remarks, they come after repeated calls from the US for Beijing to put more pressure on North Korea over its nuclear and ballistic missile programs. It also comes after Donald Trump met with Chinese President Xi Jinping at the G20 summit in Hamburg on Saturday, with the US president calling it an “excellent” meeting in which the two spoke about trade and North Korea. US Treasury Secretary Steven Mnuchin said following the meeting that “substantive discussions” had taken place between the two leaders. “In regards to China, we had very direct discussions about North Korea. We had very direct discussions about military and security cooperation,” Mnuchin said. “I think that President Trump made very clear to President Xi that he is focused on this issue, and wants to move forward and make progress. And I think President Xi gave a very interesting perspective from their standpoint,” he added. The talks followed public discontent by Trump over China's continued trade with Pyongyang, with the US leader tweeting last week that any cooperation between Washington and Beijing was unlikely when it came to the North Korea issue. However, as Trump continues to express a desire to work alongside China when it comes to North Korea, Beijing has accused Washington and Seoul of worsening tensions in the region with joint military exercises. The US and China are also in the midst of tense relations over Washington's decision to deploy the Terminal High Altitude Area Defense (THAAD) system to South Korea, with Beijing saying it threatens China's security and will do nothing to ease tensions. North Korea says its nuclear and ballistic missile programs are non-negotiable, “unless the US hostile policy and nuclear threat to the DPRK are definitely terminated,” according to the official state news outlet KCNA.